Was it just last week that we left my mother’s? When we left my mother’s house, as usual my mother sends us on our way with left-overs and all sorts of other goodies, this time she gave me the pears that she had received in her fruit basket. Now you know how much I forget stuff, well those pears were packed away in the trunk and they were forgotten. Out of sight, out of mind has become a huge reality in my house so when my hubby cleaned out the trunk completely, he brought in the plastic bag and out came the pears. 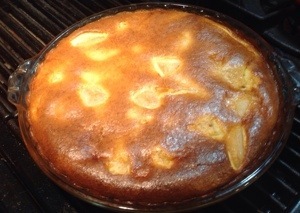 My mother had suggested making a pear clafoutis when she had graciously given me those pears, oops. Luckily enough, it has been so cold that those pears didn’t go bad, they froze in the trunk and as they defrosted last night in the refrigerator, they were nice and tender when I peeled them and sliced them up to put on the bottom of my glass pie dish. They smelled very sweet so I am hoping that the clafoutis has a nice strong pear flavor when we slice it this evening. I am fairly sure that I have written about what an easy dessert clafoutis are to make; all I had to do was throw 4 eggs, 1/3 cup of sugar in the blender, whip that around on high until light and creamy and then throw in 1 tsp of vanilla, 1 tsp of lemon zest, 3 tbs of flour, 3 tbs of ground almonds, 1/4 tsp of sea salt, 1 cup of heavy cream and i/2 cup of whole milk and whirl that around for a bit. 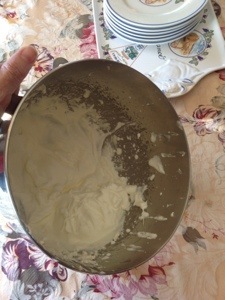 I took my blender and poured it over the pears already sliced and waiting in the buttered glass pie dish. My oven was preheated to 350 and 45 minutes later, the clafoutis was golden brown on top and the knife came out clean when inserted. I promise you that if my head were not attached, it would be gone or forgotten in a trunk somewhere just like my mother’s pears. I am so happy that the pears didn’t get wasted due to my memory lapse. I hope that everyone enjoys my pear clafoutis, the pears may have been an afterthought, but the love was poured into making the clafoutis, the same way that the batter was poured onto those forgotten pears, slowly and with much care. The thing that I love most about myself is how easily I find humor and humorous situations. I adore laughing and I laugh at least once every day. I don’t have a gentle laugh, it isn’t elegant by a long shot. It is raw, loud and spontaneous, it comes from deep in the gut, exploding outwards, assailing some with its hyena-like sound. My family loves my laugh and my baby girl especially likes to brag it about it to her friends, she likes to think that my laugh is very contagious. My hubby is connected to my love of laughter and humor, he is the main reason as to why and how I laugh every single day. He is so very funny and he knows me better than I know myself so I am constantly surprised and I erupt in spontaneous laughter. He records shows that he knows will get me gasping for air from non stop laughing. They say laughter is the best medicine and so I have a brilliant physician for a husband because he keeps me well dosed in laughter and I am so very lucky and thankful for it. My sweet hubby surprised me this afternoon with a delicious smackeral of mashed potatoes and sausage, one of my favorite food combinations of all time. My hubby knew that I was tired and not feeling great so he surprised me with this small dose of delectable goodness, the salty pork sausage complimenting the creaminess of the mashed potatoes so nicely that it just melts in your mouth. My hubby takes care of me really well when he can and he knows what flavors and smell tempt my taste buds and nose so that I cannot even refuse if I wanted to, I am very lucky. I love sausage. There are so many ways that sausage makes everything better; sausage and mashed potatoes, sausage and eggs over easy, sausage and sauerkraut, sausage and ratatouille, sausage and peppers and sausage and oysters. The sausage and oysters is a typical French combination, the saltiness and savory sausage goes so well with the brininess of the oysters, they even have festivals in France to celebrate this stellar combination. 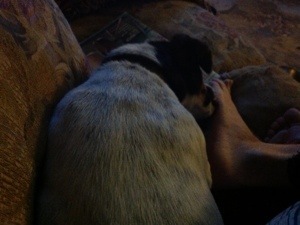 My hubby and I are back home and our little Jack is so happy to see me that he has been at my side continuously since I walked in the door. 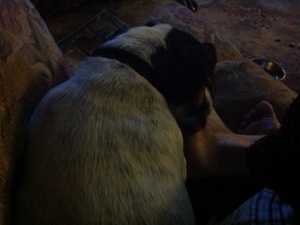 He loves his papa but with me, we have a special Maman and baby bond, so he has either been on my lap, sitting next to me or lying next to me licking my feet. 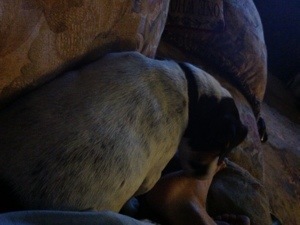 He thinks that licking my feet is his primary job, when I am home with him, he takes care of my feet every night, it is part of his going to sleep ritual; first he crawls underneath the covers, licks my feet for what seems to be forever and then he curls up and goes to sleep right next to me. I am so lucky that I sleep like the dead because Jack can be stifling, at least that is what my baby girl says each time that she tries to sleep with Jack, but I never feel it. I sometimes wonder how he sleeps, because I am sure that he must get pushed around and squished at various points during the night, I know that I must turn from time to time, but every morning when I open my eyes, Jack is right there waiting for me to wake up, his cute little face near mine. These pictures are showing Jack at work, taking care of his Maman. He is such a little lover, the little lamb. Yesterday I went to the pool to see how the water level was after the torrential downpours of friday. After I had the hose siphoning the excess water out of the pool, I spied a new blossom on my peony bush, the bloom was so full and heavy, it was drooping. I decided that I was going to cut and bring it inside to present it to my hubby. 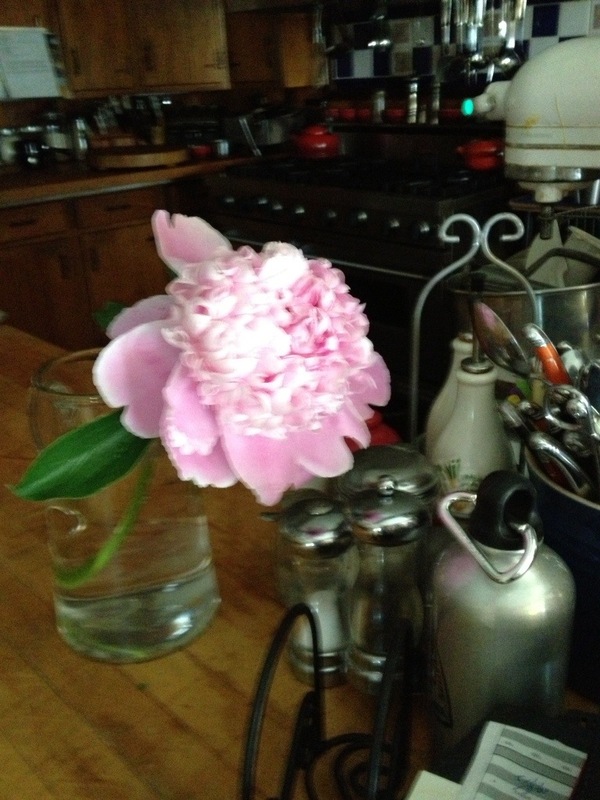 I came inside with the peony bloom and said to my hubby “Happy I love you day”. He was so happy and gave me a big hug and a big kiss. It is so easy to make a special day, all that is needed is your resolve and decision. It came to me when I saw the peony, today was a perfect day for a I love you day. So take a moment and create your own happy I love you day. It will make your day brighter and nicer. I fell in love with a movie and a phrase “everything will work out in the end and if it isn’t working out, then it isn’t the end”; the movie’s title is “The Best Exotic Marigold Hotel”. It was fantastic! I adored all of the actors; Maggie Smith, Judi Dench, the young Indian Actor from Slumdog Millionaire, the actor who played Victor in “Underworld” the vampire movies and other talented British actors. The setting was tremendous; the Indian countryside, villages, towns and market places, the colors, the people, the animals; every thing in the film had a place and a purpose. One of the messages that resonated with me, was the one discovered by Judi Dench’s character Evelyn, even without experience, you can forge ahead on your own and move forward, one step at a time. The implantation of older English people in this rundown Indian Hotel is all about “elderly care outsourcing”. How unfortunate retirees cannot afford to grow older in their own countries and are forced to seek economic refuge elsewhere, preferably in places that still respect and revere the elderly. That premiss was slightly shocking, because although I am well versed in the conflict over job outsourcing, I had never extended that economic policy to elderly care. Could we really be heading to that end? The tension that lay within each character was how open they each were to new experiences, foreign culture, foreign tastes, heat and plumbing in all respects. It was such a treat to see those who went from trepidation to acceptance and then love of their new home. On the flip side, it made me sad to see those who couldn’t wrap their minds around the new possibilities of their life in India. This movie, like life, couldn’t afford everyone a happy ending, some had to be disappointed, thankfully it was the few and not the many. This movie needs to be seen. Seriously. Happy Valentine’s Day everyone! My hubby spoiled me this Valentine’s Day with not one, but three cards, a bounty of ice cream and a truly beautiful orchid. What amazed me was just how strong my hubby’s ESP actually is; I never think, when I am out and about running errands, that I would like an indoor plant or flowers, yet yesterday, I was in a store and I saw a display of orchids and I thought to myself “I would really like one” and I kept that to myself and went about my day. 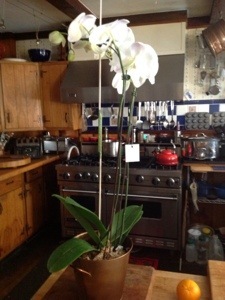 My hubby comes home not only with ice cream and cards but with an orchid. I hope that I do better with this one than the other one that I had several years ago; I couldn’t get it to ever bloom again. 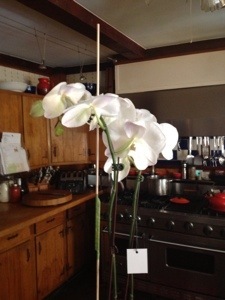 My cousin Francoise is a gifted orchid care giver and this past summer, she gave me some tips; leave the orchid alone and DO NOT OVERWATER, otherwise enjoy its beauty. 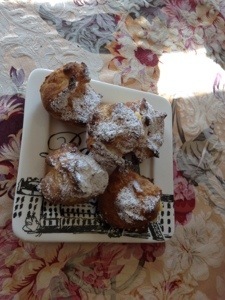 On my end, I prepared a few of my hubby’s favorites; a tomato, roasted red pepper, fresh mozzarella and basil salad, cream puffs filled with vanilla pastry cream and a big bowl of creme Chantilly. I also found a card that expressed exactly what I wanted to say which is fairly rare; I usually go for the humorous card because the other ones are too sweet, this year I found the perfect card. I was thinking of writing a love letter so I googled the origins of Saint Valentine and what I found took the wind out of my inspiration. The origins are murky but all in all there is the martyrdom of Saint Valentine, killed by the Romans for defying their edicts and the timing of mid February revolves around the Pagan festival of fertility where a goat was sacrificed and its hide was cut up into strips, dipped in its blood and the women of the village were hit with the bloody strips thereby helping their fertility. I prefer the commercialization of today focused on card exchanging, candy and flowers; less blood and guts. You have three hundred words to justify the existence of your favorite person, place or thing. Failure to convince will result in it vanishing without a trace. Begin. My hubby is a one of a kind. He has the gift of the spoken word; he could sell snow and ice to the Inuit and they would love him for it. I am speaking pre-climate change, they would be especially thankful right now but that would fail to showcase how exceptionally talented my hubby is when it comes to selling anything. He sold me on the idea of marrying him on the first date. He made me laugh, now I know that I laugh easily, but he can really make me laugh, the deep down organic from the belly laugh. Whats more is that he loves doing it so much which makes it even more endearingly special. No one has ever made it their mission to make sure that I laugh every day and taken such pride in the fact that they can make me laugh. My hubby also makes it a point of making sure that he takes care of me with my health and my teeth, since he knows how much I dislike the doctors and the dentists. He prides himself on being the boss of me in that regard, otherwise he tells everyone who will listen that I am the boss in every other way and he just follows my direction. He also likes to shower me with presents, especially books too which I can only say hooray and thank you my husband because books are simply the best presents in the world. Books of any kind; cookbooks, historical books, science-fiction, biographies, any kind really, I am not picky. We also share the same interests; food, travel, t.v, movies, love of babies and dogs. He is definitely not boring, I am consistently entertained and kept on my toes with my hubby. It has been twenty-two years and it has gone by so incredibly fast, like the whirlwind that so aptly describes my hubby. There is my love/hate relationship with my hair, there are days that I love my hair’s thickness and there are days when I hate my hair’s frizziness. I love my easy sense of humor and I love my love of reading; as long as there are words, I am never bored. I subscribe to the German publication Der Speigel daily newsletter. It’s translated for me, though I wish that I spoke German, I find it to be such a cool language. Who knows, maybe one of these years I’ll get ambitious and take introductory German. Anyway, I digress, I was reading the saddest article in today’s newsletter. As I was scrolling down the various articles, the upcoming Greek elections, the mystery and conspiracies going on in the Vatican, Venice sinking and flooding, the Indonesian Island nations being flooded by rising seawater or sinking from shifting tectonic plates in the Australian sea, I came upon the last article and this was the one that really grabbed me. I opened it because I don’t know about you, but a century old love story between the Galapagos tortoises intrigues me. Their journey began in 1897 when they were born, they grew up together and eventually became a couple. Isn’t that cute, they survived World War 1, World War 2 and the Cold War. They have been at various zoos in Austria and in 1976 were transported to their current zoo in Austria. Their handlers saw Bibi, the female, turn and attack her partner, Poldi, in a “rage” and bite off a piece of Poldi’s shell. The handlers intervened before Bibi could do more damage to Poldi. This was so upsetting to all of their handlers and to the scientists as well. This tireless love story suddenly over? The tortoise experts thought that Bibi may have undergone some mental degradation, but after a battery of tests, they determined that Bibi was fine both mentally and emotionally. They then fashioned a fake tortoise and sprayed it with essence of Poldi and put it into her enclosure but to no avail, Bibi wasn’t interested. The experts were so sad that this epic 115 year old companionship was over, could it be a simple mid life crisis on Bibi’s part? Galapagos tortoises live 150+ years so who knows,maybe Bibi felt that Poldi wasn’t fulfilling her needs any longer and she wants a new beau, only time will tell. I hope that the journalists keep an eye on this story to give us an update on Bibi and Poldi and if they ever reconcile or if they find new love elsewhere.